Former Nigeria international Celestine Babayaro returned to Chelsea last weekend to feature in a friendly between Chelsea Legends and some of Africa's youngest footballers, Africa XI. The Chelsea Legends, who were coached by Eddie Newton, also contained Dennis Wise and the Ghanaian Michael Essien. It was the Blues that took the lead before the number seventeen shirted Africa XI player restored parity when he bundled the ball home after a bullet header struck the woodwork. Speaking to the official website of Chelsea at the end of the friendly at Cobham, Babayaro said : ''Good to see the lads from Africa with the collaboration of Chelsea and Rexona. 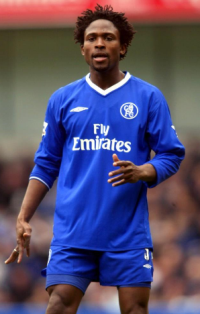 Babayaro, who later played for Newcastle United, was Chelsea's most expensive teenager when he joined the club from Anderlecht in 1997 for a transfer fee of £2.25 million.